MULTIMATERIAL FUSED DESIGN Combines TPE firm core for easy handling and TPE soft flanges for comfort and fit. QUADRUPLE SOFTFLANGE DESIGN Provides all day comfort and superb attenuation. FLEXIFIRM CORE Easy to grasp, aids in insertion. DETACHABLE CORD SYSTEM Soft braided fabric cord adapts to worker preference or application. HEARPACK STORAGE CASE Easy to stow on a break, store between shifts or keep right at hand. GREEN COLOR Denotes small size. MULTIMATERIAL FUSED DESIGN Combines TPE firm core for easy handling and TPE soft flanges for comfort and fit. QUADRUPLE SOFTFLANGE DESIGN Provides all day comfort and superb attenuation. FLEXIFIRM CORE Easy to grasp, aids in insertion. DETACHABLE CORD SYSTEM Soft braided fabric cord adapts to worker preference or application. HEARPACK STORAGE CASE Easy to stow on a break, store between shifts or keep right at hand. GREEN COLOR Denotes small size. 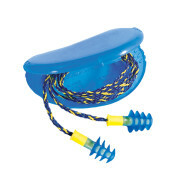 Fusion multiple-use earplugs use advanced manufacturing technology to deliver a revolutionary combination of all-day comfort and easy handling. Its FlexiFirm™ core ensures easy insertion into the ear canal and a superior fit all day long. Fusion’s patented Soft Flange™ design adjusts perfectly to the ear canal to deliver unmatched comfort and superior attenuation. Two sizes – regular and small – provide optimal fit for comfort and safety, while its soft braided fabric detachable cord system adapts to any application. Fusion multiple-use earplugs use advanced manufacturing technology to deliver a revolutionary combination of all-day comfort and easy handling. Its FlexiFirm™ core ensures easy insertion into the ear canal and a superior fit all day long. Fusion’s patented Soft Flange™ design adjusts perfectly to the ear canal to deliver unmatched comfort and superior attenuation. Two sizes – regular and small – provide optimal fit for comfort and safety, while its soft braided fabric detachable cord system adapts to any application.